It was Timmy Belcher’s dream to hold a cycling and running event in support of Rainbow Kidz, the program that helped him and his family during his battle with cancer. In March of 2011, the first Rainbow Kidz Ride & Run was held. On July 8, 2011, Timmy passed away, but his legacy lives on in the Timmy Belcher Memorial Rainbow Kidz Ride & Run. Award presentation for Runners will be timed accordingly as the winning runners cross the finish line. Cyclist enthusiast can choose from a 10/35/60 mile bike ride and enjoy a scenic ride through North Iredell County. Cyclist will "Ride & Seek" picking up tickets at rest stops to be added to the pot to win a prize pack valued at $250! The longer the distance you ride, the more tickets you will receive! Runners/Walkers can choose a 10K or 5K run through the beautiful neighborhoods surrounding Lakewood Park in Statesville, NC. All rides and the 10K and 5K are professionally timed through Blue Mountain Revival Productions, with real time results uploaded as you cross the finish line! Pull your race results up and print them to take with you, with our new kiosks! 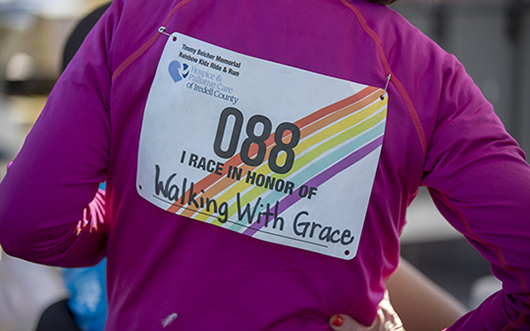 Personalize your own race bib and run in honor of someone special. All proceeds will support Rainbow Kidz, a pediatric program of Hospice & Palliative Care of Iredell County. Rainbow Kidz supports patients and families who are dealing with a life limiting illness or have experienced the loss of a loved one. The fastest growing portion of this program is the Grief Groups offered in our local schools. This past year alone, we served more than 300 children in 35 schools throughout Iredell County. More than 50% were suffering the loss of a parent.